For those continuing to use this site for research and study, I’m pleased that it is still a useful resource on the 2006 selection of the UN Secretary General. If you are looking for information on a second term for Ban Ki-moon, or would like to learn about campaigns for other senior multilateral posts, you should now visit GlobalMemo.org. In The UN Secretariat: A Brief History, Thant Myint-U and Amy Scott (International Peace Academy) provide an engaging review of what could otherwise be an extraordinarily dry subject. Even for UN enthusiasts, a history of administrative and staffing concerns of the Secretaries-General could be a bit of a bore. But Myint-U and Scott enliven the subject wonderfully, conveying the charm and political savvy of UN officials, staff and diplomats who are often left characterized as undistinguished bureaucrats. While not focused on the selection of each Secretary-General, an observant reader will discern within the text an entertaining thread of insight on how each of the UN’s chief executives were chosen over the last 60 years. Perhaps unsurprising, regional discrimination had a strong influence, even in the organization’s earliest days. But Scott and Myint-U note how, in contrast to today’s “tradition” of regional rotation, the early UN Secretaries-Generals were chosen from a gradually restricted number of countries, driven predominantly by Cold War politics and the interests of the Soviet Union. The first Secretary-General, Trygve Lie of Norway, was selected in part under Soviet insistence that the Secretary General not be a North American, British or French national. In 1953, the acceptable sources of candidates were further restricted so as to not include Latin Americans, given that region’s considerable voice and influence in the General Assembly and perceived alliance with U.S. interests. By the late 1950s, the Soviets had grown weary of Western candidates and proposed a ‘troika’ of regional Secretaries-General. This was only dropped with the selection of a non-Westerner, U Thant, in 1961 and his reappointment in 1966. As the UN General Assembly became majority non-Western, Myint-U and Scott’s narrative tells how the East-West rivalry in selecting the Secretary-General was replaced with a North-South opposition. Soviet disgruntledness diminished in the late 1960s, giving way to China’s rise as advocate for the developing world. After grudgingly accepting two terms for Kurt Waldheim in the 1970s, China vetoed his candidacy for a third term. The next three Secretaries-General would originate from “southern” or developing countries – Peru, Egypt and Ghana. In 2006, China’s regional and growing global influence all but eliminated consideration of candidates from outside Asia; South Korea’s Ban Ki-moon was elected in October 2006. Like the selection of the Secretary-General, the Secretariat itself is given little definition in the UN Charter. The UN Secretariat documents how each Secretary-General, once chosen, structured and reformed the institution’s hierarchy to suit their own interests and vision. Readers familiar with the current arrangement of departments, offices, ASGs and USGs will enjoy the authors’ description (and use of organigrams) to reveal a singular history of how these came about. At the same time, Myint-U and Scott avoid a sense of historical completion by considering in their summary observations the politics and questions that (will) continue to influence the Secretariat’s organization, staffing and independence. While at times, the material still succumbs to the inherent dryness of such administrative and diplomatic histories, Myint-U and Scott maintain an undemanding style by including stories and anecdotes that reveal the genuine and flawed humans tasked with global leadership. Espionage and suicide, demands for better housing, and direct confrontations between Secretariat officials and Soviet, American and other representatives all make for entertaining reading. The UN Secretariat is not available for sale from Amazon or other online merchants. Order a hardcopy by contacting the International Peace Academy at (212) 225-9632 or download it for free at this link. Dr. Asha-Rose Migiro assumed office today as the third Deputy Secretary General. Her formal appointment marks the post’s continued development and her performance will continue to shape its role within the constellation of global leadership posts. Last month, I finished my graduate work on the Univeristy of Maryland with the completion of a project on global leadership selection now being refined as a grant-funded project with a leading policy institute. For those with an interest in this topic, you are welcome to download and read a description of the proposed project. Those interested in working on improving the selection processes of any or all of these posts and/or the proposed Improving Global Leadership Selection project are welcome to contact me at . Kent J. Kille’s new work From Manager to Visionary: The Secretary-General of the United Nations is an insightful look at character and leadership among the seven past Secretaries-General of the United Nations. His study fills a critical gap in the existing literature by addressing the impact of each office holder’s leadership style apart from the international politics of their day. In introducing the goal behind his study, Kille suggests a division that marks previous works on the Secretaries General. Many scholars overlook the specific character of the individual office holders, the vast majority suggesting the political conditions overwhelmed any significant differences. Others suffer from what Kille describes as the “super Secretary-General syndrome,” praising all seven past Secretaries-General equally. Though calls for a study of leadership styles appear in the literature, none offer the type of analysis which Kille provides. Kille’s quantitative analysis offers a predictive framework within which an office holder is likely to respond to the constraints placed on them by the Charter, member states or events. At the same time, he offers his assessment without making the subject overly academic or inaccessible to the layman. The UN Secretary-General operates through numerous avenues to manage or influence the work of the organization. Broadly speaking, these include shaping the organization’s agenda through his strategic political position and by making political statements, involvement in the peaceful settlement of disputes, and in the administration of UN peacekeeping missions. For comparative study, Kille reviews in detailed case studies the ways in which the higher scoring Secretaries-General within each leadership style used these opportunities for influence. In Kille’s assessment, Kurt Waldheim represents the more managerial Secretary-General, Dag Hammarskjöld the more visionary, and Kofi Annan the more “strategic” in their respective approaches. No one leadership style, Kille concludes, should be preferred for the post of Secretary Generalship. A rotation of managers, strategists and visionaries would maintain member states’ confidence in the United Nations as an organization and in turn allow it to evolve in the governance of international relations. Further research could refine the leadership styles Kille has proposed and more accurately explain the approach each Secretary-General took to the office in relation to the events of his day. At a minimal, Kille and others should attempt to refine the metrics in ways that describe Secretaries-General’s style so as to address Thant’s “outlier” characteristics, perhaps by proposing additional leadership styles that allow for more refined predictions. More revealing would be studies that successfully relate the styles of individual Secretaries-General within the political environments in which they find themselves. Such might employ counterhistoricals to the extent possible, if only as an intellectual indulgence. How might the managerial Thant have addressed the U.S. action in Iraq? How would Annan have responded to Khruschev’s shoe-banging? Would Boutros-Ghali have been as visionary during the 1973 oil embargo? From Manager to Visionary is a new seminal work in the literature and clearly earns Kille a place in the company of Erskine Childers, Sir Brian Urquhart and Edward Luck as an authority on the Secretaries-General. His contribution will influence how other scholars describe the impact of past Secretaries-General and, for many of us today, will undoubtedly be a key resource that we turn to in assessing the words and actions of Secretary Ban Ki-moon over the next decade. A website about the new Deputy Secretary General was launched yesterday, but any connection between the site and Dr. Migiro is uncertain at best. Update, Jan 9: As suspected, the site is not authorized by Dr. Migiro or the UN. Brendan Varma, a spokesman for the UN, informed me that the UN Legal Department will be sending a “cease-and-desist” notice to the person posting information to the site. An official site for the D-UNSG is being planned. The site was registered to a Mr. William Mushi. Googling Mr. Mushi’s email address brings up some questionable Tanzania-related sites, most of which appear to be offering business or investment opportunities in the country. The site itself is registered under a business unrelated to the United Nations, Videos and Games, in New York. The design and content is very basic, and there are a number of misspellings and grammatical errors. The guestbook is also malfunctioning, as entries are not posted. I have emailed Mr. Mushi and UN officials regarding the site, and will update readers when I receive a response. For the moment, it would be best to assume the site is not authorized by the Deputy Secretary General or by the United Nations. Dr. Migiro, whose appointment was only announced Friday, is not expected to arrive in New York until late this week at the earliest. Secretary General Ban today named the foreign minister of Tanzania, Dr. Asha-Rose Mtengeti Migiro, as his Deputy Secretary General. The announcement could be said to reflect the media’s nickname for Ban - “the slippery eel” - in that Dr. Migiro’s name escaped being included in any list of speculated candidates. Spokesperson Michèle Montas noted that the decision had only been made this week after additional consultations. As of only two weeks ago, there had not been “any inkling that she would be named Deputy Secretary General.” Montas also noted that Ban’s short list had not, contrary to most speculation, been limited to women. Dr. Migiro is expected to arrive in New York in the next 10 days to take up her duties. Update, Jan 14: Dr. Migiro will arrive in New York on January 15th, but as Deputy Secretary General-designate, accordinng to Friday’s UN Noon Briefing. She will not be taking up her formal duties until early February. Through her distinguished service in diverse areas, [Dr. Migiro] has displayed outstanding management skills with wide experience and expertise in socio-economic affairs and development issues. I have deep confidence in and respect for her, and intend to delegate much of the management and administrative work of the Secretariat, as well as socio-economic affairs and development issues, under a clear line of authority to ensure that the Secretariat will function in a more effective and efficient manner. At today’s noon briefing, Montas faced some tough questions from the UN press corps about Dr. Migiro’s qualifications. As Dr. Migiro has only been foreign minister of Tanzania since January of last year, James Bone asked whether Ban had met with her during his campaign/trade visit to Tanzania. Montas did not know, but assumed he did work with her on that visit. Richard Roth questioned Dr. Migiro’s appointment in terms of the management experience necessary to undetake the the enormous management reforms expected this year and Ban’s intention to delegate to the D-UNSG most of the day-to-day management of the Secretariat. …the organization faces massive problems - staff morale being down, the capital master plan, the building being renovated, questions about corruption, the procurement office…why is someone who spent years as the Minister of Community Development, Gender and Children’s Affairs remotely the best candidate for this? Well, you should probably give her a chance to show it… It was the Secretary General’s opinion that she is a highly qualified person, and among the people he was choosing from, she is the best qualified. Montas did note that Ban had spoken with Dr. Migiro by phone this week. 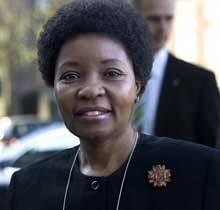 Other questions included whether her role as Chair of the Great Lakes was not more of a diplomatic post without managerial responsibilities, why Ban did not make an appointment in time for his assuming office, and why Ban did not wait until Dr. Migiro was present to answer such questions on her qualifications. Montas responded that the decision to annouce was made partly in response to reporters’ insistence. She assured the press corps that Dr. Migiro “is very willing to come talk to you” when she arrived. Names of several women are beginning to emerge as possible candidates for Deputy UNSG. Ban has stated his intention to appoint a woman to the post, and most observers are certain that the candidate will hail from a developing country. Obaid and Khalaf, Saudi and Jordanian respectively, are rumored to be the front-runners. The nomination of either would ”would send a message to the Arab world about the need to empower women.” This could make the appointment of either confrontational, a characteristic not usually associated with Ban. If his choice comes down to either Obaid or Khalaf, he will almost certainly engage closely with Muslim and Arab General Assembly members prior to any announcement, which could occur by this Friday. General Assembly approval is not required for appointment to the number 2 post, though India’s Ambassador Nirupam Sen has suggested extending the role of the General Assembly in confirming Under Secretary Generals to include the Deputy UNSG position as well. Reportedly, India and Pakistan are jointedly leading an effort in this regard, but no change in the process is expected in terms of Ban’s selection. UPDATE, 4 Jan: According to a permanent mission source, information from “the 38th floor” suggests that the Deputy SG post will go to a African, and that Ngozi Okonjo-Iweala is a leading candidate. Ban Ki Moon’s took the oath of office with his left hand firmly placed on the UN Charter - a new practice which he himself provided for in instructions today. Ban Ki Moon’s swearing in on Thursday will be roughly the one-month mark since his arrival in New York to assume the post of UNSG. His selections for the Deputy UNSG post and the “holy trinity” of Under UNSG posts - Peacekeeping, Political Affairs and Humanitarian Affairs - are expected to be announced between taking the oath of office Thursday and 1 January. One woman that has been mentioned is Anna Tibaijuka, head of the UN Habitat in Nairobi. Another suggested candidate is Maria Angela Holguin, former UN Ambassador from Columbia. Some diplomatic scuffle is occuring over nationals of which government will be asked to fill two of the top Under Secretary General posts. The U.S. is challenging France’s traditional hold on the USG for Peacekeeping post, and the United Kingdom and Nigeria appear locked in a battle for the post of USG for Political Affairs. Regardless, Ban and his advisors are being particularly quiet about possible appointees, so any speculation is simply that. The process for making appointments to these posts should attract due attention by governments as well, given their strategic importance within the UN system. Those wishing to follow efforts should check out the Top Appointments blog as well as the soon-to-be-launched successor to the UNSGselection.org project at UNelections.org. UNSG.org was created to provide a useful, comprehensive resource that makes the selection of the eighth UNSG more accessible and open to both close observers and the general public. The word from friends at several missions, non-governmental organizations and in the media would suggest that it has been not only informative but influential in that objective. Now that we know Who will be the Next UN Secretary General, those same colleagues have asked what will be the site’s focus? The objective remains, for the most part, unchanged. Minister Ban is to be congratulated on being selected, but the site will not transform into a ”Ban Watch” or otherwise judgmental assessment of his administration. The larger goal will remain to provide information on the process of selecting the Secretary General of the United Nations and highlighting ways that process can be made more open, transparent and accountable. That being said, over the next several weeks the site will cover the appointments of UNSG-designate Ban to the vaunted Under Secretary General positions and other key posts. A short review of the process will be posted in the next few days followed by rumored names and nationalities. In general however, UNSG.org will follow up on efforts to reform the selection process, significant progress toward which occurred this year. A number of the proposals advanced this year by governments and civil society groups however deserve continued consideration. Many of the reforms suggested were realized not through formal action but at the initiative of candidates or civil society groups, and such may provide more momentum toward their formal acceptability the next time. Governments and civil society should also not fail to critically review new procedures used this year (was the new Security Council processes effective?). But the more important reforms, ones which would require intergovernmental agreement in the next selection (formal qualifications for the office, a timeline for nominations and selection, and public forums or hearings), will require civil society groups to stay committed to a more open and transparent process not just in but rather over the course of the next 5-10 years. Such continued engagement on the selection of global leadership is not unrelated to civil society or government’s immediate interests. The heads of the WTO, WHO, UNDP, OECD, WFP, World Bank, IMF, UNHCR and the IAEA have been filled in the last three years. The senior posts that will come open in the next five years will provide sufficient opportunities for governments and civil society groups to recognize the more effective and accountable methodologies in filling such positions well before 2011/2016. Otherwise, we’ll all be right back here again in a few years. Copyright© 2006-2010. UNSG.org and respective authors. Text may be used for non-commercial or educational (including media) uses provided reference is made to UNSG.org. All Rights Reserved.